Doggy daycare has gained popularity over the last few years. While it may seem like nothing more than a new trend, doggy daycare offers both pet parents and their furry family members a myriad of benefits. One of the hardest parts of having pets is having to leave them, but doggy daycare can help with this heartache by giving pet parents peace of mind in knowing their pup is in a safe, supervised, energetic environment. Here are five benefits of taking your precious pooch to doggy daycare. Want to learn more about our Top Rated Local® pet lodge and ranch in Ketchum? Contact Sun Valley Animal Center to enroll your dog in our doggy daycare program. We proudly welcome pets from Ketchum, Boise, Salt Lake City, Spokane, Billings, and beyond! One of the things dog parents worry about when they have to leave the dog at home is that their pup isn’t getting enough exercise. Dogs have a lot of energy and they need to burn that energy by walking, running, and playing every day. Doggy daycare is a great way to give your dog the exercise they need while you’re at work. Part of a dog’s exercise comes from playtime. Playtime is essential for a dog’s health and happiness, as it stimulates their mind, keeps them engaged, and keeps them active to burn off energy. When a dog comes to daycare, they will be grouped with other dogs depending on their age, size, temperament, and socialization abilities. We have a beautiful doggy daycare facility that allows your dog to play indoors and outdoors with other dogs under the watchful eye of a highly trained and loving daycare supervisor. Our staff is trained to recognize and interpret body language, which helps ensure that all dogs in our daycare program are safe and comfortable. Dogs are social creatures and need to spend time with other dogs to learn how to act and behave properly. They learn from each other — both what to do, and what not to do. Getting to play with other dogs can benefit their socialization skills in general while helping them learn how to play nicely with others. This is especially beneficial for puppies and young dogs. Plus, running and playing with others is a great way for them to let out their energy. Doggy daycare provides the perfect opportunity for them to meet new pups, smell new scents, make new friends, and just be a dog. Another benefit of doggy daycare is that pups get to meet and socialize with other humans. Interacting and playing other humans can improve their behavioral and socialization skills, allowing them to feel more comfortable around other people, rather than just the people in their family. At Sun Valley, our daycare attendants provide dogs with the interaction they crave by playing with them, giving them treats and snuggles, and plenty of scratches and pets. Above all, doggy daycare helps combat against boredom and loneliness while you’re away. Whether you kennel your dog or let them roam free in the house while you’re gone, boredom can set in. When dogs get bored, they can become mischievous and even destructive. It’s not that they have it out for your shoes that they chewed up while you were at work, but more that they needed something to keep them busy. Doggy daycare programs are designed to be stimulating for pups to keep them active and engaged. They can rest and enjoy some downtime, too, but always having something new to sniff or another dog to play with is an effective way to fight boredom. Experience the Benefits of Doggy Daycare Today! There are simply so many wonderful benefits to be gained from taking your furry friend to doggy daycare. As a pet parent, you want the very best for your dog, so why not give them a place to frolic, exercise, and socialize while you’re at work or on the go? At Sun Valley Animal Center, we want to give your precious pup the best care while they’re staying with us. If you would like to learn more about our doggy daycare, tour our facility, or bring your dog in, give us a call or reach out to us online! We’re here to help your dog live a healthy, happy life! 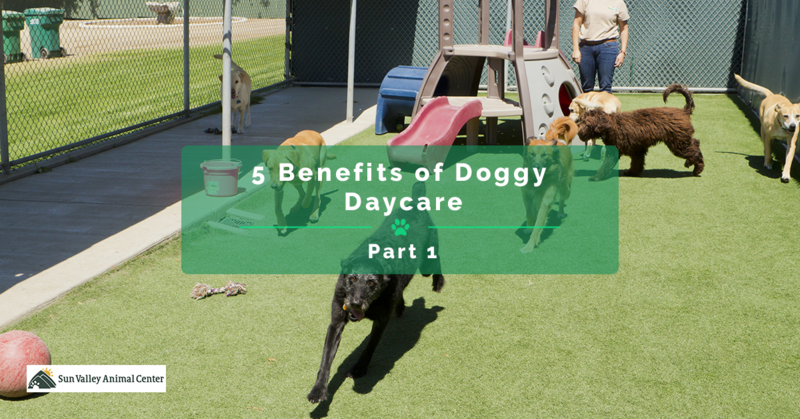 If you still need a little more convincing before bringing your pooch to our doggy daycare center, be sure to tune in for part two to learn even more benefits of bringing your pup to doggy daycare.